Current North American Champion, Travis Odenbach, won the 2011 Changing of the Colors regatta by only one point over David Van Cleef. Hosted by the Lake George Club in upstate New York, the event is one of the premier regatta on the U.S. racing calendar and this year attracted 65 boats. Conditions were challenging for the competitors with 25+ knot winds limiting the fleet to only one race on Saturday before the committee chose to send the sailors back to the club. Sunday’s racing was much more accommodating with 18 knot winds allowing for two more races to be completed. 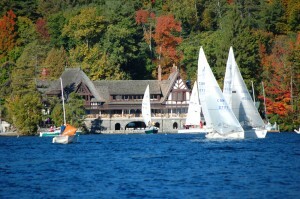 As is typical for this regatta, most of the competitors have already pre-registered for next year’s regatta. The local hosts put on quite a show so you should mark this one on your calendar for the future.